FBI Director Samuel Lord is back, this time working with NASA to uncover the mole sabotaging some top-secret NASA projects aboard the Empyrean. But there’s an additional problem – some self-replicating nanites are proving volatile on-board and attempts to eradicate them are ineffective. Octogenarian Sam Lord is given these outer reaches assignments by the FBI home office, and he and his team are thorough, dedicated, and completely committed to doing what’s ‘right.’ Lord has the full support of the FBI on this case with NASA. The nanites are set in motion by the spy and while the nanites are confined, there’s great danger that they will burst from their container and destroy everyone in the ship as they reproduce on a massive scale. All the different Earth governments connected with the station have a plan they want to see implemented to contain or destroy the nanites, but Lord and his crew plan to go a different route, given their first-hand observation of the nanite behavior. Just as with the first book, I went in with moderate to low expectations and came away slightly surprised. Sam Lord is a well-crafted character and clearly a character for Shatner himself to play if this were to ever get picked up for film or television. In this volume, I felt that most of the other characters really fell into the background and were nothing more than extras in this story. And the story itself…? It was moderately interesting. The character of the nanites was not particularly new or innovative, but Shatner/Rovin built up their traits slowly and kept the reader engaged. However, I was about 3/4 of the way through the book and I made a note in my edition that reads “We’re still dealing with these nanites? !” While they danger was not insignificant, I did feel that we’d spent way too much time in one, confined space looking for a solution to one problem, given the number of characters and settings in which this book takes place. There is a small surprise regarding the nanites, but it isn’t really set up particularly well and it’s resolved a little too easily, once the discovery is made. For this book, I enjoyed the characters, but felt that the story these characters were working in was not really worth the effort. This was a real middle-of-the-road read for me. Looking for a good book? 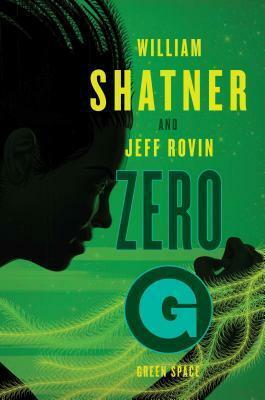 William Shatner and Jeff Rovin’s Zero-G: Green Space is the sequel to Zero-G, with the same cast of delightful characters, but in a story that didn’t really capture my interest.